Ariana: "Definitely, like magic and cosmic themes. I'm really into crystals and stuff like that as well." Clay: "I've never really thought about it. You know, if I see something I like, I'll get it. I don't really know..."
Arian interjects: "I inspire his style." If you've been reading fashionist for awhile, you know I have a soft spot for couples that have a cohesive style. Notice how these two are keeping to the same pallet of gray, white, and black. So their colors are the same, but the proportions, the form of their clothes are distinct. Ariana is wearing a 90s-era paper bag silhouette (complete with squared-off crop top and "paper bag" pants) and Clay keeps everything in a slim and fitted silhouette. 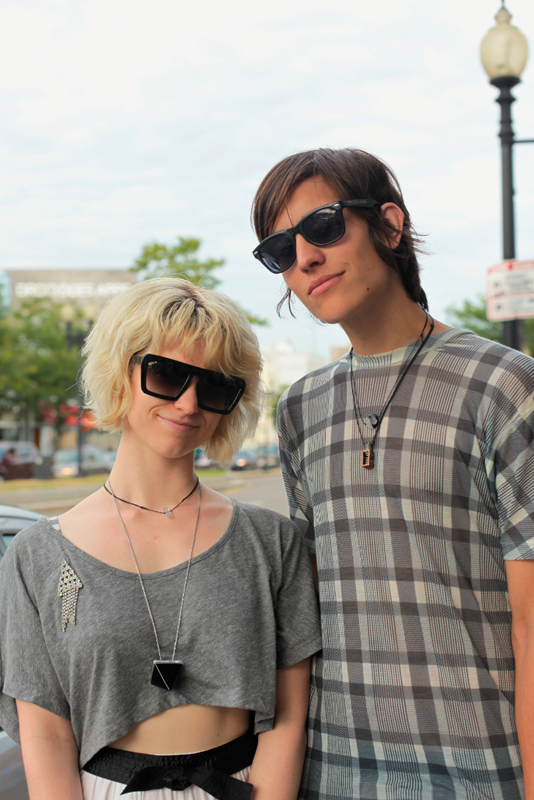 They both also have a knack for accessorizing: double pendant necklaces, sunnies, her bangle. So good. Probably all unintentionally inline with the other, but visually interesting nonetheless. A look at her plastic silver gladiators and his all black Converse All Stars.